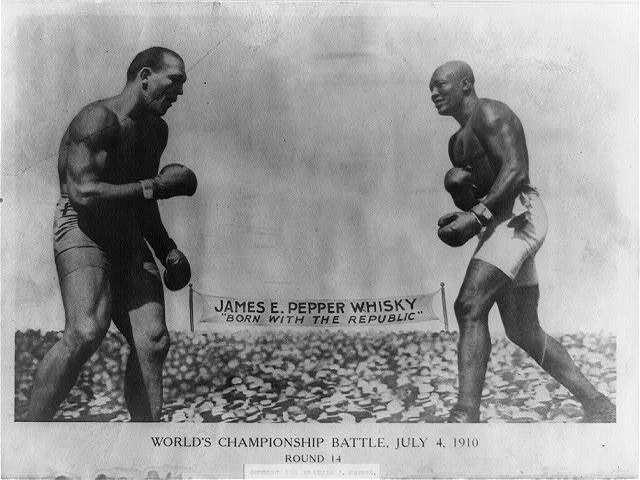 1908 Jack Johnson became the 1st black HW boxing champion 08 Barack 1st black pres.? Discussion in 'Boxing Discussion' started by DownRightFierce, Apr 1, 2008. Too bad Barack won't be president until 2009.
shucks than 1 year off.... here I thought it was an insightful thought and connection on my part...does it totally negate the relationship between the 2 tho? will he be elected in 2008 and not take office till 2009 or....? god, screw Ali's story. This guy got the real screw job. He even asked to join the army and they wouldn't let him. Nothing this guy did was OK.
well when he lost willlard most of america was happy,thats the only hw champ I woulent want to be.a shame he went thru bs his entire career. Obama isn't a natural hw, though. I think he fights lhw. I don't know why they didn't let him either. A good way to ge tthe title vacated is to get the guy shot. He was ashit disturber, but like you have to give the guy his due. He only wanted what he deserved. He never came off as preachy as Ali or anything. I always thought he was more so a guy just trying to survive. Love it when he hit on chicks in the crowd while clinching with guys, lol. physically he might be lhw, but his ideas are paperweight division at best. I don't think this is really that insightful. Comparing them by their faculties of memory, reason, and imagination, it appears to me, that in memory they are equal to the whites; in reason much inferior, as I think one [black] could scarcely be found capable of tracing and comprehending the investigations of Euclid; and that in imagination they are dull, tasteless, and anomalous. It would be unfair to follow them to Africa for this investigation. We will consider them here, on the same stage with the whites, and where the facts are not apocryphal on which a judgment is to be formed. It will be right to make great allowances for the difference of condition, of education, of conversation, of the sphere in which they move. Many millions of them have been brought to, and born in America. Most of them indeed have been confined to tillage, to their own homes, and their own society: yet many have been so situated, that they might have availed themselves of the conversation of their masters; many have been brought up to the handicraft arts, and from that circumstance have always been associated with the whites. Some have been liberally educated, and all have lived in countries where the arts and sciences are cultivated to a considerable degree, and have had before their eyes samples of the best works from abroad. The Indians, with no advantages of this kind, will often carve figures on their pipes not destitute of design and merit. They will crayon out an animal, a plant, or a country, so as to prove the existence of a germ in their minds which only wants cultivation. They astonish you with strokes of the most sublime oratory; such as prove their reason and sentiment strong, their imagination glowing and elevated. But never yet could I find that a black had uttered a thought above the level of plain narration; never see even an elementary trait of painting or sculpture. In music they are more generally gifted than the whites with accurate ears for tune and time . . . . Whether they will be equal to the composition of a more extensive run of melody, or of complicated harmony, is yet to be proved. Misery is often the parent of the most affecting touches in poetry.